We like to make our updates interesting, so what’s better than giving away cash? Below, we will share the story of how we (Jonathan and Thomas) met. But first, we would like to hear from you. By simply entering your name and a short story (a couple sentences or paragraphs) about how you met one (or both) of us, you will be entered. We will be doing two giveaways. The first will be a random drawing available to all that submit their info, with the winner receiving $100 in CASH. The second will be a story chosen based upon the best (or funniest), with that winner receiving $50 in CASH. And who knows, it could be the same person! All entries must be received no later than August 31, 2014. Go to http://www.radiantpropertygroup.com/august-2014-giveaway/ to enter now! 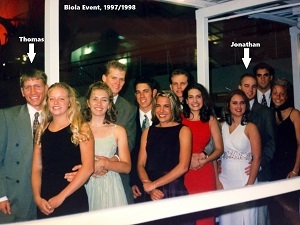 In 1997, Thomas returned from New Mexico for his 2nd year at Biola University and was busy with his classes and soccer. As for me (Jonathan), well, I was working a number of odd jobs and dating Jennelle, a Biola freshman who later became my wife. Thomas and his future wife Kendra, along with Jennelle, were part of a larger group who became fast friends in their first days at Biola. Although I didn’t attend classes at Biola, I felt like an honorary “social” member. Thomas and I first met through this group at a few events and became friends. During those years, our group of friends grew closer, and eventually couples within that group started getting married. Thomas and Kendra were married on July 1, 2000, in Colorado, while Jennelle and I tied the knot three weeks later on July 21st in Southern California. As we have stayed in contact with this group, we’ve shared exciting times such as holidays, buying first homes, welcoming children to our families, and taking vacations together. By 2004, while teaching at Mt. SAC in Walnut, Thomas decided to get his real estate license. Around that same time, I was working for a home building corporation in Orange County and also decided to get my real estate license. Thomas shifted from teaching to becoming a full time real estate agent, and I used my license to help some friends and family purchase homes as I worked full time in real estate development. When the residential real estate market crashed in 2008, I was fortunate to find work at my church EV Free Fullerton as a project manager for a new construction project. Thomas continued to work hard as an agent and learned much about how to weather the up and down seasons in the real estate industry. As the work at EV Free was coming to an end, Thomas and I were in a position to evaluate what would come next. In August of 2009, Kyle Kalma, another one of our Biola friends, approached us with an idea of forming a real estate team. We were each licensed Real Estate Brokers and had the desire to form something bigger than ourselves. We adopted the name Radiant Property Group and launched our new team in January 2010 by connecting with TNG Real Estate Consultants in Brea, a company who shares our convictions for serving our clients well and provides the opportunity to network with like-minded agents. Although Kyle remains highly committed to his promotional products business, he stays involved as an important referral partner and team member of RPG. Meanwhile, Thomas and I spend our days building a referral-based real estate business committed to caring for our clients and guiding them through one of the most important investments of their lives. It has been nearly 5 years since we teamed up, and we couldn’t be more pleased with how things are going. Thank you for making this a success story. It is because of you that we are able to do what we love each day. We are continually blessed by your thoughtful referrals. We look forward to finishing 2014 with a bang and seeing many more of our clients smile as we hand them the keys to their new homes or place that “SOLD” sign on their front lawns. Two homes on one property! 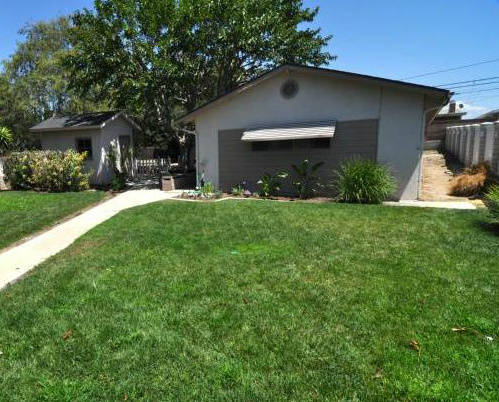 This is an amazing opportunity in the popular South Brea neighborhood. The front house has 2 bedrooms(could be 3 bedrooms) and 1 bath, the back house has 1 bedroom and 1 bath. Not only that, but these homes sit on a HUGE lot that allow you to add on, create outdoor living spaces, or build your dream pool. Walking distance to the popular downtown Brea area with shopping, movies, and restaurants. Located in the excellent and award winning Brea school district too! Don’t wait! Make an offer today! Would you recommend us? Do you know us well enough to refer us? An honest evaluation of their needs, wants, and goals. A second opinion if they have received unwelcome information in the past. Support in any situation, whether a standard or short sale, a purchase for residence, or an investment. Likewise, if you are considering selling your current home or buying a new one, we would love to sit down with you and discuss the best possible solution to meet your goals. We want to step it up this summer and serve many more clients. Our team is in place and ready for action. 2013 has been an incredible year for Radiant Property Group. Each year, Thomas and I sit down and discuss our goals. We talk about what we would like to accomplish as a team. In a business where there are so many agents and choices, we realize that every person who contacts us regarding real estate is a VIP. Because we have chosen to build our business on word-of-mouth and referrals, it is our friends, family, and past clients that have built our business. To put it lightly, we are very, very thankful for you! We are on track to not just meet our goals for 2013 but exceed them in October…and we still have a few months to go! Holly Diaz joined our team in March of this year. She is a licensed agent who brings a background in design and customer service to our team. As our Administrative Assistant, Holly specializes in staging our listings, assisting with showing appointments, and following up with many needs that arise with our clients and transactions. Her attention to detail has been a huge addition to our team! Tatiana Luna is our Transaction Coordinator. She joined our team in July at a time when paperwork had become overwhelming! We realized we needed somebody organized and familiar with real estate transactions. Tatiana has a background in short sale negotiating and real estate coordination. Having her on our team has been awesome! Our piles of paperwork are gone, our efficiency has been greatly increased, and Thomas and I are thankful that we can now spend more time focused on selling and finding new homes for our clients! We are confident that with your continued support through referrals, our team’s ability to provide excellent results will be known throughout this community. First and foremost, our goal is always to provide the best service. We do that with an approachable, honest, down to earth style that brings peace of mind to those who provide us with the opportunity to assist them with their real estate goals. Thank you again for thinking of us and for making us one of the top real estate teams in North Orange County! Radiant Property Group is based out of Brea, California, and serves clients with selling and buying homes throughout the Los Angeles and Orange County Metro areas. We would love to sit down with you and discuss your current goals, whether that is selling your current home or buying a new one. If you have any questions please do not hesitate to contact us today! We recently had the pleasure of working with a fantastic young couple who were looking to buy their first home. Their dream was to find a duplex that would allow them to live in the front unit and use the back unit for a rental or to house a family member. Good duplex properties tend to be unique and harder to come by, but we were committed to exploring all their desired areas with the hopes of finding them just what they were looking for. After reviewing the options on the market and being outbid by all-cash investors, we decided to take a more proactive approach in assisting them. We were able to zero in on a couple of neighborhoods where there were a considerable number of duplex properties. We crafted a letter to the owners of these homes, which included a picture of our clients, a little bit of background about their search and qualifications, and our desire to help them find just the right place in a tough market for buyers. A few days went by after mailing out our letters. We were not sure what kind of a response we would receive but were hoping to get at least a few responses. An email arrived late one night from the owner of a duplex in Orange. This gentleman was living in Wyoming and told us he was contemplating selling his property if we could get him the price that he wanted. Fortunately, his expectations were in line with the current market value & our clients’ target price range. Within just a few days we had a signed contract and were able to open escrow. Our clients are now living in their new home and have done an amazing job of remodeling it! In a market like this, having agents who are willing to strategize and think outside of the box is critical. It is unlikely that we would have found our clients their duplex by sitting, hoping, and waiting for just the right property to come available. If you know friends or family who could benefit from our out-of-the-box approach to real estate, we would love the opportunity to meet with them and discuss a custom plan to find them the right home. We would like to congratulate Tiffany C. of Fullerton, CA for winning Radiant’s most recent drawing for a $100 Visa gift card. Radiant Property Group will have future contests and opportunities to win various prizes, so check back on our website or “LIKE” our facebook page (www.Facebook.com/RadiantPG). We greatly appreciate all your participation, feedback, and referrals as we continue to build our business. We are excited for this year, and we would love for you to keep us in mind as your trusted real estate consultants for your friends and family. Happy New Year from Radiant Property Group! Happy New Year! We are so thankful for your continued support which has helped make this a special year for Radiant Property Group. We want to give you a quick update by sharing with you five exciting things that you may not know about our team! Despite what is considered to be a very tough economy, Radiant Property Group is not only still serving our real estate clients, but our business is increasing and growing. We are thankful for the referrals and recommendations that are no doubt leading to this positive trend. We recently launched our new website! We hope that it will be a place for you to find valuable real estate resources and tools. Please visit it today at www. RadiantPropertyGroup.com, and let us know what you think! In addition to this, we have recently moved to a new office. We are located in the Birchbrook Business Park at 3000 E. Birch Street, Suite 102, Brea, CA 92821. If you or anybody that you know is considering buying or selling a home or property, we offer valuable real estate consulting services. We would be happy to set up an appointment to discuss goals and help lay out a plan. There is no cost or obligations for this service. This is especially helpful for first time buyers who are unsure of what purchasing a home requires in terms of the transaction process and qualifying for a home loan. Radiant Property Group has a 100% success rate with Short Sales. In these tough times, it is important to know and choose a team that doesn’t just talk a big game, but comes through even in the most complicated and bleak-looking situations. Don’t EVER let your home, or a home owned by someone you know, go into foreclosure. We can help with short sales, and short sale sellers do not have to pay us a SINGLE PENNY. Ask us how. Our team has experience and success in all four local counties (Los Angeles, Orange, San Bernardino, and Riverside). Transactions include first-time buyers, investors, move-up buyers, clients who want to sell and downsize, short sale listings and purchases, probates, and bank-owned foreclosure purchases. As we enter in to 2012, our goal is to continue to focus on placing our clients first and to provide service that is unmatched in the industry. Enclosed you will find a couple of our business cards. Please feel free to pass them along should you know of anyone looking for a Realtor. Referrals from you are what will continue to allow us and our clients to succeed in this ever-changing market. Class, outstanding service, and great specials are what you can expect from the restaurant formerly known as the Fitness Grill. As I sat in my tastefully decorated booth location, with the Laker game playing on the plasmas; I was shocked to discover the depth of their menu, and their wine list. This is the type of place that locals should be rooting for, and frequenting. You get the sense right away that this is not another corporate-owned operation, but the sweat and passion from proprietors Diana Bock and Beth Castro. It is family owned, with a sense of professionalism and pride in what they do. If you are looking for bang for your buck, City Grill is the place for you. You can find out what is going on in a typical week by visiting their Facebook page, which is regularly updated with their special events. The menu has everything from pizzas to steaks, sandwiches to pasta. The wide array of food that was ordered at my table looked and tasted fantastic, and drew very warm reviews from all. What was the greatest surprise of all was how affordable my entire meal and experience was once I received my bill. Value and bang-for-your-buck are a few terms that come to mind. So this week as you make your plans, you should strongly consider the City Grill and the great people who are behind it. You will not be sorry. In fact, once you give it a try, I have a feeling that you will become a regular. Click here to visit their website. City Grill is located on the corner of Brea Blvd. and Imperial Hwy, right next to Corner Bakery in the City of Brea. Don’t Become a Commission with Eyeballs! Question: Why are most people (including real estate agents) in business today? Common Answer: To make a profit, of course. I have sat with many business people who are locked on to one thing. How can I maximize my profits, make the most money possible, and be “successful”? The issue that I have with this logic is that it eventually leads to a serious problem. At some point, everyone faces a challenge where they have to choose between doing what is right by their clients, and making the maximum profit. If the number one objective is to make money, then they will choose the money. So what should be the answer to the above question? Why am I, and Radiant Property Group in business today? My Answer: To be trustworthy advisor to my clients for one of their biggest, and most important investments of their lives. If we view you, our clients, as nothing more than commissions with eyeballs, we are doing you a major disservice. You would hope that this would be rare, but it isn’t. Did you know that there are several consultants out there that hold seminars and teach agents scripts? These scripts are meant to corner you, the client, and make you feel as if you have nothing left to argue with, and to say yes. Each script ends with the same line, “Now just sign the contract”. Are all agents who use scripts dishonest? Probably not. But what I do not feel they are taking in to account is each of their clients’ individual needs, their unique journey, and a desire to be more than just another “closed deal”. We want to build a business based on trustworthiness, and on reputation. Our desire is to enter in to your journey with you. In the end, it is not about whether you make us money, it is about the peace of mind that you will be able to have while you search for a home, sell your home, or decide to stay right where you are. I would like to challenge you to, no matter what you do for a living, to think about why you are in business. Are you in it for the money, or are you in it to provide a valuable service to others? It starts with changing the type of mentality we take to work each and every day. We must reconsider the urge to treat others as commissions, or paychecks with eyeballs, and start looking at the bigger picture of how we can help one another on our journey through this world. I am confident that if we do that, the money part will take care of itself. Have you checked on your home value lately? The housing bubble forced many home owners to do their best Ostrich impersonation, and I really do not blame them. It has been a scary and even depressing time, especially for those who bought at the top of the market in the mid 2000’s. This caused many to stick their heads in the sand and literally become ignorant to their largest investment’s value. The times are changing though, and although the market may not see the type of recovery that current home owners would wish for in the immediate future, there are some good reasons for you to take the time to find out what your home is worth. Reason #1: It may not be as bad as you think. No, your home is not worth what it was in 2006, but today we are seeing increases in property value in many areas across Southern California. Data and reports come out every single day in the newspapers and on the internet that give both good and bad news, but the only way to know for sure about YOUR home is to research your specific neighborhood, and the comparable sales close to your home. If your neighborhood is targeted by buyers, and there is not a large supply of homes, you could be in a better position than you think. Did you know that Radiant Property Group will give you a free comparative market analysis with no strings attached? We are happy to partner with you, and provide you with information that will empower you with much greater accuracy than online sites that assign value with little accuracy. Many programs exist that you could be taking advantage of. Without knowing what your home is worth you could potentially be spending too much of your hard earned money each month. Banks are being strongly encouraged to work with their borrowers, and we have seen some amazing results for people who have the right people working by their side. Radiant Property Group has had success in working with clients to stay in their homes, and lower their payments to a level that they can afford. Reason #3: Things probably are not changing for a while, but the show must go on! You have goals. You want to make financial strides in the next five years, ten years, and beyond. All signs are pointing to the fact that as a whole, values are not going to be fluctuating drastically one way or another for some time. Our government and the lenders are working hard to keep the market steady, and consumers will not be ready to fork out 2006 type money on a home until the entire economy is roaring again. With this in mind, it is wise to take your head out of the sand, and get a firm grasp on where you stand. Stop running from reality, and find some peace in knowing what your biggest investment is worth, and what you need to do to begin to plan for the future. We look forward to your call and an opportunity to serve you! Looking for an early test of your New Year’s resolution to get in shape? The 20th annual Brea 8K is scheduled for Sunday, February 27th. Proceeds from this race are donated to Brea Olinda High School’s Arts program, so not only do you get to participate in a great run through Brea’s streets, you also will be benefiting the community! For more information on the race, you can visit their website or Facebook pages. Registration is well underway. Now is a great time to set your goals, and begin training for a distance that will challenge new runners and those of you who are just getting back in to shape. For expert runners, this U.S. Track and Field sanctioned and certified race can be an opportunity to show off your speed and skill! If you do not wish to run, but would like to help in some way, you can visit their website to find out about volunteer opportunities. These can range from helping at registration and set up, to handing out t-shirts and water. Happy New Year everybody! See you at the finish line! Do you know a good mechanic? Yes, this is a question that I hear all the time. It is probably because most of us know very little about the inner-workings of our cars, and we feel concerned that we will be over-charged, or misled to believe that our car needs major work, when maybe we just need a new sparkplug. It has not helped one bit that investigative journalists have caught mechanics and jiffy-lube attendants duping folks with perfectly running vehicles that they need a whole host of repairs. I was one of the disillusioned and concerned right up until a couple of years ago when I was referred to a garage in Placentia called Super Service. Buddy Dubois grew up working in his Dad’s auto repair shop. For years he learned the ropes at this family business located in Inglewood until the commute got too much to handle. An opportunity came up to purchase an existing, well regarded auto repair shop in Placentia. Seeing that this was a blessing and a chance of a lifetime, Buddy purchased the shop and has been in business ever since. This year marks his 33rd year as the owner of Super Service, which is an understatement for the way that he treats his customers. Not one for fanfare or flashiness, Buddy has built his book of business on referrals and word-of-mouth, which is exactly the way that I found out about him. His shop does not stand out when you drive by (see photo), and he does not even buy extra space in the yellow pages. The truth is, he doesn’t need it. When you can combine his expertise in fixing both domestic and foreign cars, his reasonable pricing, the good turn-around times, and the all-important trust factor, you know that it is no accident he continues to thrive after three decades. He will always explain what he is doing before he starts his work, and will be the first to admit if certain repairs can wait, or if they are more urgent. He literally looks for ways to save car owners more money and make the less expensive repairs first, hoping that it will correct a problem before recommending major service. Placentia Super Sport is located at 643 South Melrose Street in Placentia, north of Orangethorpe and just east of the 57 freeway. His hours are Monday through Friday, usually 8am to 5pm. He will work on all domestic, Asian, and European models, and has the latest in computer diagnostic tools at his disposal. You can reach him at (714) 528-1828. Chances are, he will answer the phone. Thank you, Buddy for your service and care for your customers. You are making North Orange County a better place to live!